It probably is no secret at this point but we LOVE winter in our house. 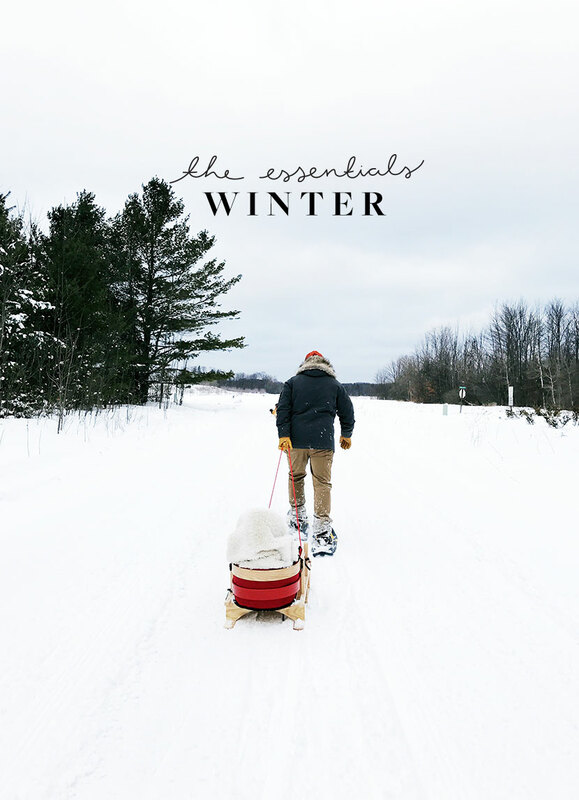 We love the holidays, but deep winter is probably one of our favorite things and after welcoming the official start to winter yesterday we wanted to share a few things to help make winter REALLY enjoyable. From snuggling in the evenings to warm cooked meals at home to low lighting in the evening to getting outside in every way possible. We have found that finding the right essential items for winter life was key. Winter is best lived with the contrast of cold and hot. Getting chilly and then warming up albeit a fire, a warm meal, or a good tromp through the snow on your favorite trail. There is so much to love about winter but sometimes you just need to surround yourself with the right things. Whether you live in a cold climate or not, I am convinced a fireplace is essential to life. We have been using this Malm one at our house we are renting, but in our new home, we opted for a gas fireplace for maintenance and allergy reasons. Either one is a great option depending on your needs. I LOVE these lanterns from Rejuvenation. They offer warm and low light for winter mornings and nights. You could either put flameless candles in them or real ones. The milky glass diffuses the light perfectly. Having the right lighting this time is extremely critical to enjoying the dark days. You will be making a lot of coffee, tea, and so on through the winter months to warm up. In our house, this kettle has been our mainstay. It looks great and performs even better. It comes in other colors, but we opted for the classic black. I highly suggest reading this article about the Danish tradition of Fika that you will need the right kettle for. Oh yeah, a robe is essential, but I hate the fluffy kind. This flannel one from Coyuchi is a dream. Getting out of the shower and having something to wrap up is a small but great luxury. Our house is filled with them this time of year. They are places to play on wood floors or a place to cuddle up for a nap after hiking. They come with us in the car on really cold days and more. I love the ones from Restoration Hardware personally. We have about 5 in our house. It sounds cliche, but the Danish got this right. I read this book after being in Denmark and really experiencing Hygge. For us northerners, it is something we could really take notes from and we have as we built our home and making decisions on how we spend this time of year. I highly suggest this quick read if you really want to enjoy winter well. The Danish taught me how to enjoy this season and why it should be our favorite one. Since we spend a lot of time outside and a lot of time the snow is taller than Hayes can walk in we needed a great sled. Last year my parents got us this one from LLBean and it is one of our favorite winter things. It is so awesome and great for everyday use. We pull him around all over while we snowshoe. Mike and I both have these slippers and we love them so much. They are amazing and now they have some you can take outside, which I think is even better. Either way , Glerups are the slippers for winter if you want something simple and clean. If you have a fireplace it is best to have a log carrier so you can easily make only one trip out at a time. The job is still dirty, but most log carriers can be placed in a rack so you have a place to store the wood as well. I feel like no winter is really great without the right sweater. I have quite a few but a great cable knit is a necessity. I always size up so it hangs and drapes more for a cozy feeling. I am going to tell you right now that this Carhart hat is the best winter hat you could think of. For $10 you won’t find anything better. It is so warm and let’s NOTHING through it. Mike and I each have one and we love them. Like the fur blankets, we also have a lot of fur rugs around. We cover chairs to warm them up that normally can feel cold in the winter and more. They are essential to making a space cozier and warmer. Now there is a lot of debate around Down or Down-Alternative, but I will tell you right now I have had both and down works better for me. There are a lot of sustainable sources and most companies are very clear about their process. I have a Canada Goose coat but since most people don’t agree with their practices I will suggest this one from Fjallraven, that I considered but didn’t click with personally and then this 3-in-1 from Patagonia. All three are amazing and the prices vary between all of them. I have more than one pair of winter boots because winter is nearly 5 months long here, but my beans are the most worn. I have tall ones for when the snow gets really high, but when I am snowshoeing or just running errands in the snow these are the winners. I do wish I had gotten the fur in them, but I went with the Gore-tex/Thinsulate and they work great especially with a pair of Smartwool socks. They are classic and will last years! Warming up on really cold below zero nights with a bath is one of the best parts of winter. I love to add some Epsom salts or some salts like these ones from Herbivore to the bath and just enjoy watching the snow fall with candles light around the tub. These are the ones I wear all the time and they work well, but I have a lot of friends that love these ones and these ones as well. I am opting for a pair of mittens with phone touch for outdoor activities but these are great just for driving and doing things on cold days. Any winter sport really that gets you out is great, but for someone just wanting to enjoy some outdoor hiking a pair of snowshoes is amazing. They are the perfect for wading through the snow and it is an awesome workout, but this year we are going to start Cross-Country skiing on top of already doing skiing and snowboarding. Around here, we look forward to winter for the chance to do snow sports. Though the gym is a great workout the snow and winter sports is even better. Not to mention the cold air helps beat colds. I wear them every day in the winter and are the only socks we wear in our house. They don’t stink and wear extremely well. Not to mention your toes are warm. Look for the right weight for the season. They come in ultra light to heavy. Candles with a sent help create a feeling of home so finding a candle that holds the right scent for you and your family is essential to create that feeling. We love our’s to smell like Balsam or this candle is our mainstay no matter the time of year. I keep candlesticks on hand for winter so we can create nice dinners together. It took some time to get Hayes used to it, but overtime he understands that they are a part of our life and dinner at night. We use these candlesticks the most often in our house. I love to try new recipes in the winter, but eating locally in the winter can feel boring since very little is growing unless it is in a greenhouse. I love how Karen Mordechai wrote her book Simple Fare by the seasons so this one holds all sorts of amazing winter recipes for you. Part of the reason we all can feel a little down this time of year is because of the lack of sunlight. Last year we invested in a big one to use for 30 minutes every day during the morning when we were making coffee. It made a huge difference. It is back in our kitchen this year where we enjoy the light to get us going in the morning. Staying warm in the winter at night can be the real challenge. Even as someone who has a pretty warm body, I love having the right sheets so we either keep Flannel or Linen sheets on our bed this time of year. They are warm and comforting but still breathe well if you get the right ones. A great humidifier is necessary. Do a lot of research before buying one, but I love the design of this one even though this isn’t the one we have. We weren’t sure how much we were going to need one in our new house so we didn’t want to invest in one. But if I had my top pick this one or the Dyson one would be our winner. What are your winter essentials? Do you have certain things that really make this season extra enjoyable? WoodBurning stOve- check, warm throws, some fur- check, glerups- check, candles- some, need more, down parka, snowshoes, smartwool- check, check, cheCk. But i do need a boot upgrade and would love A few fur rugs and cozy robe. I love some aspects of winter but winter is long (canadian here) and wish i could embrace it morE. I’D love to be outside more but SOMETIMES the fire’s allure has a firm grip.an outdoor hottub does make the season more enjoyable- we need one at out new house.